Please note that we do NOT provide phone numbers for Walmart’s Distribution Centers. Please do NOT call with inquiries about how to contact Walmart as we do not have this information. 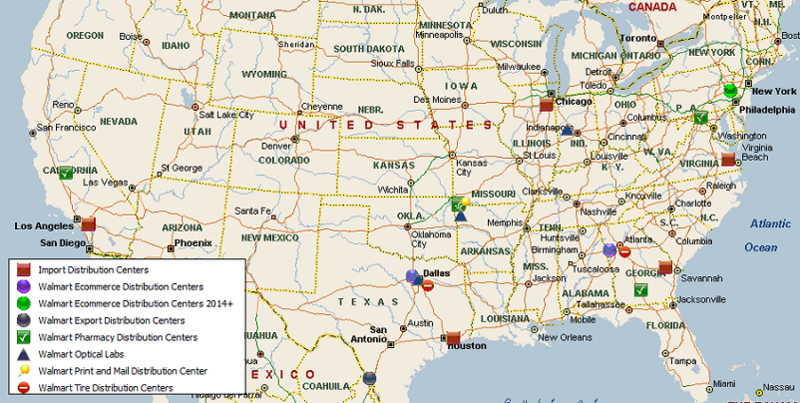 This white paper provides a history of Walmart’s distribution center network in the United States to the current day. The intent is to provide a detailed look at the evolution of Walmart’s U.S. logistics infrastructure since the time when the company's first formal warehouse operation was opened in 1970. As at 2017, we have identified 173 Walmart distribution centers & Sam’s Club distribution centers within the United States totaling 125.8 Million square feet. Looking ahead, Walmart has plans to open another 4 facilities in the United States totalling 4.2 Million square feet. Walmart’s U.S. distribution network is, for lack of a better word, massive. To put things into perspective, the entire city of Manhattan is 661 Million square feet. If all of Walmart’s distribution centers were air-lifted into Manhattan then they would cover nearly 19% of the city's surface area! Now consider that at the start of 2017, Walmart operates 775 Million square feet of retail space within the United States. Thus the sum of distribution center and retail real estate that Walmart operates within the U.S. is in the order of 900 Million square feet - nearly 1.36 times larger than Manhattan! We have taken the time to research the opening dates and square footage of each distribution center for the purpose of compiling the evolution of the Walmart’s distribution network. Now you may be wondering why on earth would anyone undertake to research this information. The answer is quite simply that we are supply chain people and we are interested in understanding how the world's most successful companies strategically distribute goods to market. In the case of Walmart, the company's multiple supply chains have evolved over the years so it is important to educate logistics professionals with an understanding of this evolution. We also undertook to research Walmart’s distribution network as a means to measure several key ratios that compare retail store square footage to distribution center square footage. To our knowledge, no one has analyzed this information in the past so we thought that this information may be useful for people seeking to understand the company's supporting distribution infrastructure relative to its retail store network. It was a painstaking effort to review 42 years of Walmart’s public financial statements and 10-K filings but this enabled us to develop the statistics and charts below that describe the ratio of net sales revenue and cost of goods per square footage of distribution space since 1970. It is important to note that in 2016, approximately 81% of the merchandise sold from Walmart stores is shipped through Walmart’s distribution center network. Similarly, 64% of the non-fuel merchandise sold from Sam’s Club stores is shipped through Sam’s Club distribution center network. The balance of sales is serviced through the DSD distribution channel (.i.e. direct store delivery refers to when the manufacturer/supplier delivers goods directly to the store. thus bypassing the retailer distribution network. This channel is often used for food commodities such as snacks, beverages, beer, fresh bread, milk, etc. For more information on DSD refer to this white paper). Legal Disclaimer - Please be advised that we do not have a business relationship with Walmart nor do we represent Walmart in any way. To the greatest of our abilities, we have provided accurate information throughout our research efforts, however there is a chance that information provided within this white paper may be outdated or inaccurate. All information within this white paper has been compiled through extensive research using 100% publicly available sources. If you wish to advise of any corrections, please do not hesitate to contact us by sending us feedback. 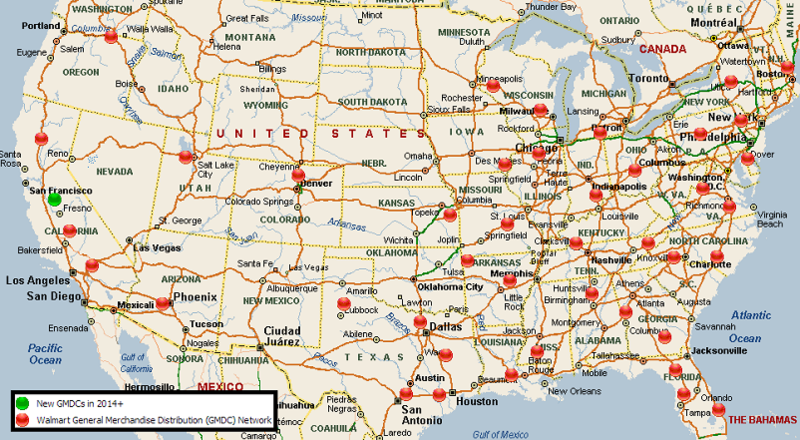 Walmart currently operates 42 regional general merchandise distribution centers in the United States totaling 50.1 Million square feet. These massive facilities are typically within the range of 1.0 - 1.6 Million square feet at 35’ clear stacking height. The average distribution center employs over 1,000 warehouse associates. The average one-way travel distance to the stores is approximately 124 Miles. Walmart’s regional GMDC facilities generally do not vary significantly in design from site to site as explained below. In general, Walmart owns and operates these facilities which serve as the strategic backbone for the company's hard lines general merchandise distribution network. The narrower rectangular portion of the facility is typically designed for a mechanized conveyor system that can be anywhere from 10 - 20 miles in total length. Conveyors are used to flow through cases of merchandise that are already allocated to store orders at the time of receiving. Each full case has a Walmart-compliant label such that the conveyance system can sort the merchandise to the correct shipping dock door assigned to a store (i.e. “door per store” is the industry term that is used for this). A typical facility may have between 90 -170 stores being serviced whereby outbound trailers are staged at dock doors throughout a shipping shift until they are cubed or weighed out. Since not all merchandise is conveyable and not all merchandise can be pre-allocated, there is also a conventional full case and split case section of the facility. This is a racked section of the warehouse within the larger rectangular portion of the complex. On this side of the complex, pallets are received on one side of the building and then putaway into storage racks. Pallets are then replenished to pick locations where merchandise is subsequently picked and either deposited to conveyor belts or to electric double pallet jacks. Full case and split case picking modules can be designed with picking to conveyors up to 3 - 4 vertical levels high. In general, bar-coded label picking is used for full case picking and put to light / pick to light is used for split case merchandise stored in case flow racks as a means to improve speed and accuracy. A portion of the GMDC complex is also used for full pallet cross docking operations. Faster moving SKUs are moved through the facility in pallet unit loads from receiving docks across to shipping docks positioned on the opposite side of the complex. Walmart controls a much larger percentage of its inbound freight as compared to most retailers, hence floor space is also used for the purpose of moving inbound backhaul merchandise through the facility to ship to other distribution centers within the network; or to serve as a consolidation point for remixing purposes. In the past, Walmart’s General Merchandise distribution centers were primarily established to distribute hard lines (i.e. non-food) commodities including electronics, health and beauty aids, sporting goods and toys, appliances, etc. Similarly, the company's grocery distribution network was primarily established to distribute dry grocery, fresh dairy/deli/meat/produce and frozen food commodities. Starting around 2006, the company began to blur the lines between the role of the general merchandise distribution network and the role of dry grocery distribution network. In effect, roughly 4,000 of the fastest moving dry grocery and general merchandise products were mixed (i.e. combined) so that these fastest velocity items can be distributed from all eligible General Merchandise and Grocery distribution centers. This remixing concept is a network strategy that is often referred to as a fast/slow distribution strategy whereby the fastest cube-movement products are positioned closer to the retail stores and slower moving products are stocked at fewer distribution points that are further away from demand points. Why does this strategy make perfect sense? Quite simply because the fastest-moving products generate the most truckload volume and therefore miles of travel to support the stores. These items move so quickly that their inventory turns are extremely fast, hence the inventory penalty associated with stocking these items at twice as many distribution centers is relatively low. On the other hand, these items generate the majority of cube movement therefore stocking them closer to the stores takes out significant over the road transportation miles. As well, the most important items are generally the products that move the fastest therefore the stores receive improved service levels for these items because they are stocked closer to the store. This is consistent with Walmart’s on-going efforts to reduce out of stocks at retail, to take cost out of the supply chain and to support its green initiatives. 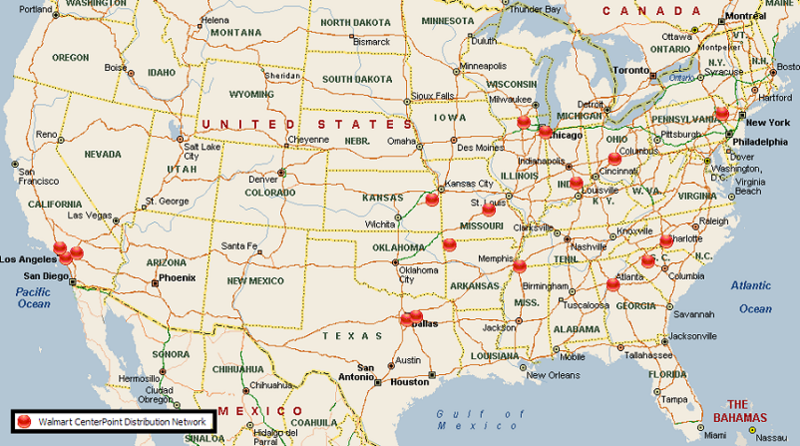 In other words, the remixing concept is a winner across all fronts.Below is a list of Walmart’s regional general merchandise distribution centers in the United States. Originally constructed to 900,000 sq ft and expanded to 1.2M sq ft in 1988. Originally constructed to 1.2 M sq ft, this facility was expanded by 352,000 sq ft in 1999 to add a Sam’s cross dock facility on the same site. This is a free trade zone (FTZ) facility that can process import merchandise. Walmart first sought approval for this facility in 2002 and public resistance delayed the controversial approval which was finally received in Nov 2012. Walmart currently operates 44 Grocery distribution centers (36 Full-Line Grocery/ Perishables, 6 Perishables, and 1 Dry Grocery) in the United States totaling 35.6 Million square feet. We are aware of one new 420,000 square foot facility that is forthcoming. The Full-Line Grocery/Perishables facilities are typically within the range of 850,000 - 1.0 Million square feet and employ around 750 warehouse associates. The average one-way travel distance to the stores is approximately 134 miles. Walmart’s Full-Line Grocery distribution centers are generally L-shaped facilities with a square-shaped Dry Grocery building forming one side of the L-shaped complex, and a long rectangular Perishables building forming the other side of the complex, The Dry Grocery buildings typically have 3 sides dedicated to dock doors to enable maximum throu ghput and crossdock capacity while the Perishables buildings having receiving and shipping docks on the opposite sides of the complex. Walmart owns and operates these facilities which serve as the backbone of the company's food distribution network including Dry Grocery, Dairy, Deli Meats, Fresh Meat, Produce and Frozen Food. Walmart was an early adopter of Vocollect’s voice picking technology to improve the speed and accuracy of full case picking operations within their grocery distribution operations. At least 17 of Walmart’s Perishables distribution centers service both Walmart and Sam’s Club stores. Over time, the Walmart and Sam’s Club food distribution networks have converged to capture synergies for logistics cost reduction purposes, particularly on the perishables side of the business. This is clearly logical since perishables usually makes up 50% of the outbound truckloads shipped to the store from a full-line grocery distribution center. Lastly, Walmart has implemented automated material handling systems in several of their Perishables distribution centers. Working with Swisslog as their integration partner, Walmart has deployed high rise stacker cranes (ASRS) which automatically store incoming pallets and then replenish multi-level picking modules where conventional voice-directed picking to double pallet jack or pick to belt is performed. Our research indicates that six automated distribution centers exist in the network as identified in the table below. One of the challenges that Walmart faces is that the company is such an efficient low-cost operator that cost justifying extensive capital investments into automated material handling systems is difficult, hence the majority of the facilities remain as conventional distribution operations. Below is a list of Walmart’s full-line grocery and perishables distribution centers in the United States. Originally constructed as a Perishables DC at 480,000 sq ft . Added 400,000 sq ft of Dry Grocery space in 2006. 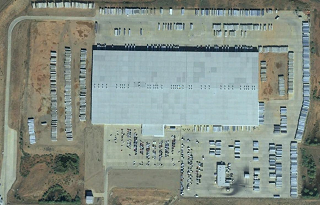 Originally constructed to 447,055 sq ft for Dry Grocery; Expanded to include Perishables in Apr 2007. Originally constructed as a Perishables facility of 370,000 sq ft. Facility was expanded in Nov 2005. Swisslog automation in the Perishables complex which has 75' High ceilings. 169 acres acquired. No announcement yet. Perishables distribution center with 400 associates. Perishables distribution center with construction 600 jobs. 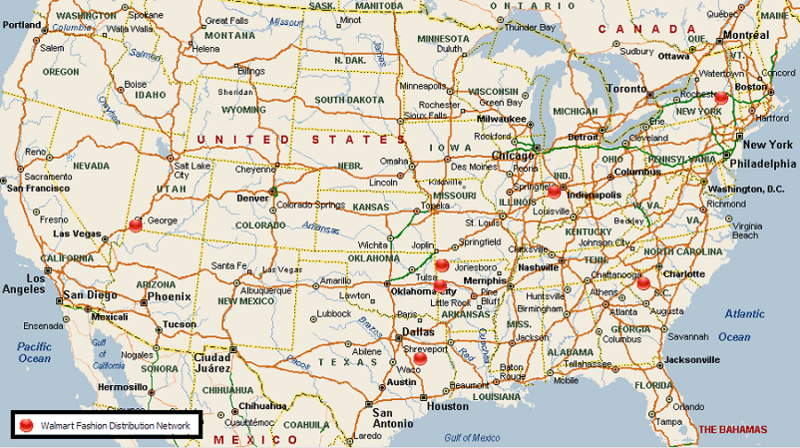 Walmart currently operates 7 Fashion distribution centers in the United States totaling approximately 7.6 Million square feet. 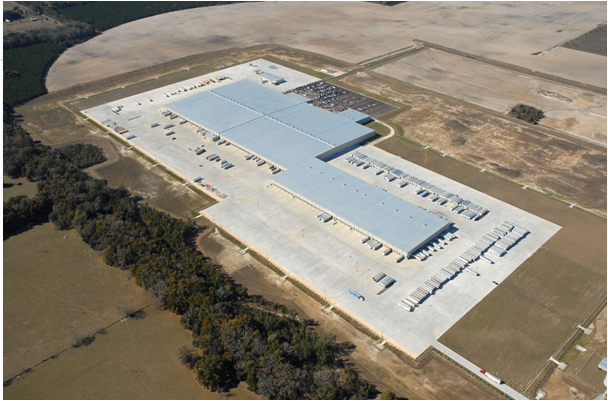 These massive distribution centers are within the range of 640,000 - 1.6 Million square feet and employ around 700+ warehouse associates. It is hard to believe that Walmart’s first fashion distribution center was launched back in May, 1972. Back then, it was a 22,000 square foot section of Walmart DC#6000 in Bentonville, AR allocated to ticketing and distributing wearables. This was actually Walmart’s first warehouse which handled both soft lines and hard lines merchandise. This facility was expanded multiple times to 236,800 square feet and in 1986 it was eventually converted into head office space. Today, Walmart’s Fashion distribution centers are generally large rectangular-shaped facilities that are highly mechanized with conveyance systems designed to service upwards of 1,000 stores. Below is a list of Walmart’s fashion and footwear distribution centers in the United States. Originally constructed to 937,000 sq ft. Expanded twice since 1991. Converted into a Fashion DC in May 1994. Walmart currently operates 12 e-Commerce fulfillment Centers in the United States totaling approximately 11.5 Million square feet. We are aware of another 3 facilities expected to be opened in the future totaling 2.7 Million square feet. 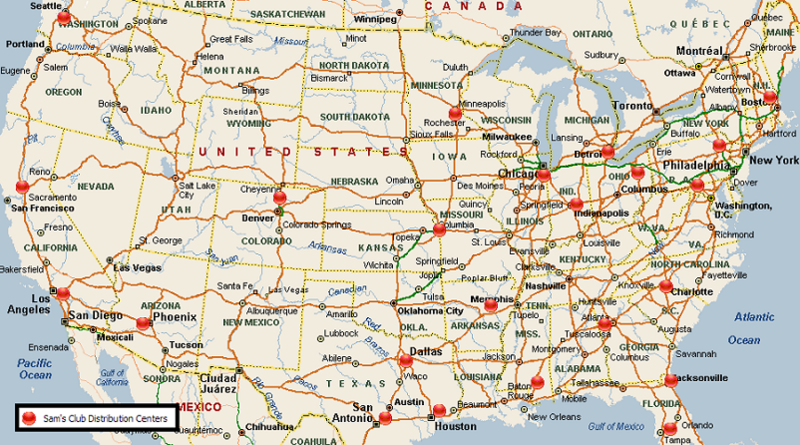 These massive distribution centers are typically opened in pairs in strategic locations around the USA with the overall objective of being able to provide 2-day service level to 90% of the country. The only region of the country that is currently under-served is the Pacific Northwest where we can expect to see a new fulfillment center announced most likely in the Seattle area. 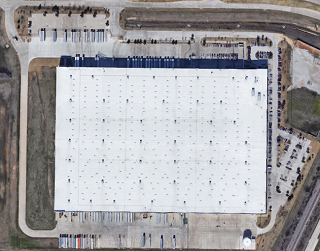 Walmart opened their first dedicated e-commerce fulfillment center in Fort Worth in 2013. The company has since been investing heavily in their fulfillment network which is supplemented by in-store order fulfillment capabilities. The company is also in the process of converting Sam;s Club stores into e-Commerce metro facilities. Below is a list of Walmart’s e-commerce fulfillment centers in the United States. Dedicated e-commerce distribution center for larger products such as furniture, TVs, patio sets and grills. Below is a list of Walmart Specialty distribution centers for which we have records. Print Solutions Distribution Center which is an In-house plant dedicated to printing materials such as signage, training manuals, labels, guides, forms, etc. Scheduled to be moved to another bldg. Originally constructed to 150,000 sq ft to serve as a redistribution center. Later expanded in 1981. This was the 2nd DC in the network. Currently serves as a Walmart Return Center with 400 associates. Scheduled to close in 2019. Scheduled to be closed in 2019. Walmart currently operates 9 Import distribution center buildings in 5 locations around the United States totaling 15.5 Million square feet. There are plans underway to add 1 new import center of 2.9 Million square feet. These massive facilities are positioned close to major U.S. p orts located in Long Beach, Houston, Savannah, Norfolk and Chicago. Each import center receives containers of merchandise from Asia Pacific (and the rest of the world) and then redistributes this merchandise to the company’s regional general merchandise and grocery distribution centers within its region. Thus these facilities are not designed to ship directly to stores. For most of these facilities, Walmart’s labor strategy has been to outsource these operations to third party logistics providers that use staffing agencies to recruit warehouse associates. This labor strategy is not unique to Walmart and this approach is typically used to establish an arm’s length relationship with the labor force. Unfortunately, the intense pressure to drive operating expenses down often places the third party logistics provider in a difficult position where they have no choice but to place increasing demands on the labor force to obtain increased productivity at a reduced operating expense. Ultimately this pressure can backfire resulting in labor-related issues that generate negative publicity for the retailer. This was exactly the case for Walmart in 2012 at two of its import distribution center campuses operated by Schneider Logistics in Mira Loma, CA and Elwood, IL. Lastly, over the years Walmart has vacated several import distribution center buildings in Mira Loma, CA and Savannah, GA. Below is a list of current import distribution centers in the United States. Announcement in June 2016. New DC in construction for July 2018. Started as a 1,700,000 sq ft DC and later expanded by 500,000 in 1999. Originally constructed to 1,000,000 sq ft and later expanded to 2,000,000 sq ft in Nov 2001 and again expanded by 1,000,000 sq ft in 2004-2005. Walmart has developed a dedicated distribution network to consolidate inbound merchandise from domestic suppliers for shipment to their distribution centers. The company refers to these facilities as Center Point distribution centers (CP) and they are utilized to consolidate inbound loads of merchandise with the goal to minimize the net landed cost of goods into their distribution network. 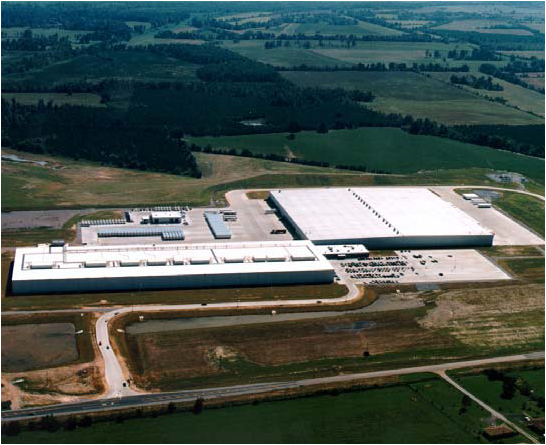 Center Point distribution centers are similar in shape and size to cross dock / LTL terminals in that they tend to be long “skinny” buildings with many dock doors on either side of the building (the exception to this rule being the facilities that are utilized for public cold storage applications). These facilities are strategically located around the country with the objectives being to minimize inbound transportation costs primarily for Less than truckload (LTL) loads. Rather than suppliers sending small shipments directly to Walmart’s many distribution centers around the country, Walmart reduces inbound freight costs by having suppliers transport their LTL loads into the nearest CP. The CP then consolidates all merchandise going to the same distribution center with the goal to achieve a full truckload inbound to every DC. Trucks are dispatched from the CP to the distribution center when a full truck load is achieved, or when a time window constraint has elapsed. In short, the consolidation of inbound LTL loads at strategic locations within the Walmart network enables the elimination of millions of inbound travel miles to replenish inventory throughout the Walmart distribution network. 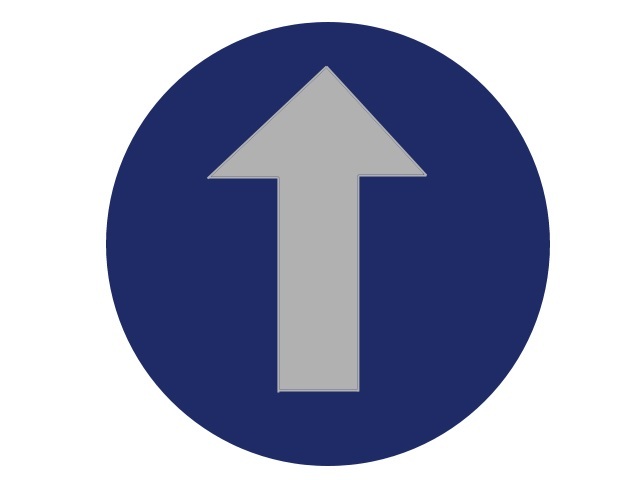 This is an important concept that can be leveraged by any national retailer seeking to reduce the net landed cost of goods within their supply chain by taking greater control over their inbound freight. Lineage Logistics operates this facility which is a public cold storage for local Southern California frozen food manufacturers. 3PL is Linc Logistics Insight Corp.
3PL is Distribution Technology Inc.
3PL is MIQ Logistics Inc.
Sam’s Club currently operates 27 distribution centers within the United States totaling 2.5 Million square feet. 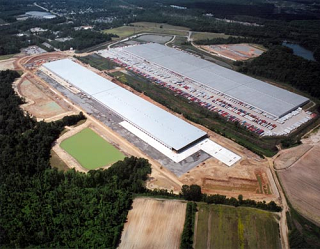 The majority of these operations are small crossdock facilities (similar to LTL truck terminals) that range between 40,000 - 100,000 square feet in size. About 8 of these facilities are owned and operated and 18 are operated by 3PL companies. Sam’s crossdock facilities are basically long rectangular shed-like buildings with many dock doors on either side of the facility. Full pallets are received on one side of the building and then a forklift driver crossdocks the pallet directly to a stage d trailer assigned to a store/shipping door on the other side of the building. In general, full pallets are handled within these cross dock operations. A couple of the Sam’s Club distribution centers are set up for high variety full case and split case picking but the vast majority of volume is shipped out as full pallet unit loads via cross dock terminal facilities. Approximately 64% of the non-fuel merchandise sold at a Sam’s Club store is serviced through the company’s distribution network with the balance being delivered directly to the store so 36% of the goods bypass the Walmart network altogether. It is not clear why Sam’s Club outsources the majority of its crossdock operations to multiple 3PL companies. Sam’s Club has a very demanding benchmarking scorecard system to measure the performance of its 3PL warehouse and transportation service providers. Each year awards are given to the highest performing suppliers based on their performance. This creates a highly competitive environment which ultimately maximizes the quality of service and productivity rates achieved across the network. Our conjecture is that Walmart outsources most crossdock operations to 3PLs as a means of keeping its distribution network flexible to the ever expanding store network that needs to be supported. As such, the crossdock network can be adjusted with greater flexibility than if the company owned and operated all of these facilities. Walmart’s first DC outside of Bentonville and 4th DC. Sam’s Crossdock facility run by 3PL Vitran Logistics Inc.
Sam’s Crossdock facility formerly run by Wagner Industries up to May 2012. Sam’s Crossdock facility run by 3PL Distribution Technology Inc.
Sam’s Crossdock facility formerly run by PSI - Puget Sound International which went out of business in Sep, 2012. Sam’s cross dock facility being added to the new Hawfields 186 acre site which will have a new Walmart Perishables facility constructed for 2016. Since Walmart introduced its first distribution center in 1970, Walmart has vacated a number of distribution centers. A list of the facility closures that we are aware of is below. There have likely been others which are off the record. Closed and converted into head office space in 1986. Import Center that was vacated around or before 2009. Import Center that was closed in 2008 and consolidated into the Statesboro, GA facility. Facility closed in August 2016 due to the detection of toxic PCB contamination. Import Center constructed for Walmart in a FTZ Zone in 2001-2002 and closed in 2006. Import Center that was associated to the McLane’s acquisition. 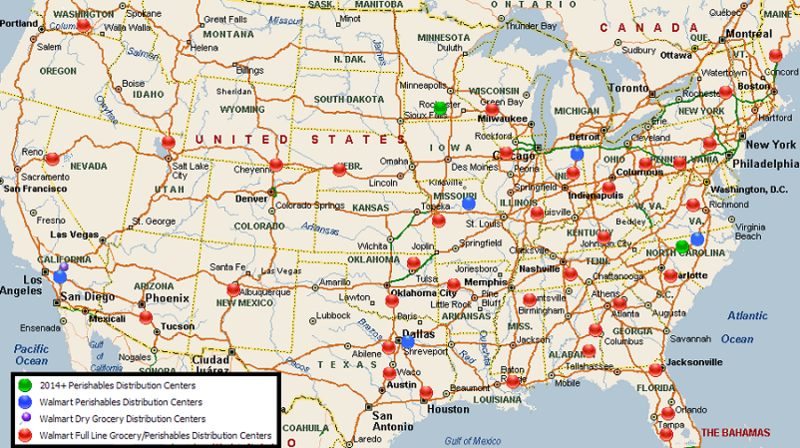 Walmart’s U.S. distribution network is depicted by supply chain in the maps below. Since 1970, Walmart’s growth in distribution center space within the United States is depicted in the graphs below. During the 1990’s, Walmart quadrupled its regional general merchandise distribution center square footage by growing from 7.3 Million sq. ft. to 29.6 Million sq. ft. It was without a doubt the logistics story of the decade. Between 1996 - 2006, Walmart exploded its supercenter concept and the company’s food distribution network rapidly expanded proportionately to support the distribution of grocery and perishables merchandise. During this time, Walmart’s grocery and perishables distribution center square feet grew from 5 DCs totaling 4.2 Million square feet to 39 DCs totaling 31.5 Million square feet - an astonishing 750% increase! It was an unprecedented assault on an otherwise complacent industry characterized by razor thin profit margins and low levels of innovation. During this ten-year period, many well known regional supermarket chains went out of business due to this sizable loss of market share. Walmart’s incredible growth in the grocery industry was indeed the logistics story of the 2000’s. Walmart publishes annual statements and 10-k forms that provide insight into the company’s revenues, profits and cost of goods sold by segment (Walmart USA, Sam’s Club USA, Walmart International). The company has also published its retail square footage information since 1969. As well, the % of sales generated from products distributed through the company’s distribution network versus the DSD channel is also published. Thus we can analyze several interesting questions to provide a unique perspective that may be meaningful. 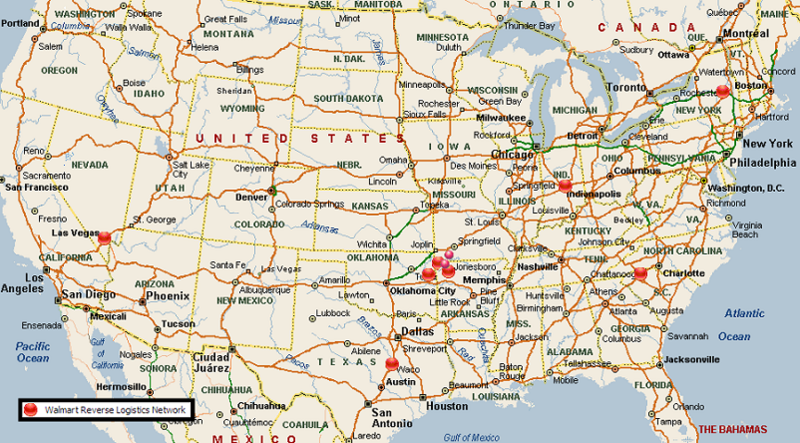 What ratio of retail square footage to distribution center square footage does a company like Walmart have in the U.S.? How has this changed over time? What ratio of net sales revenue to distribution center square footage does a company like Walmart have in the U.S.? What about sales revenue through the distribution center? What about cost of goods through the distribution center? How has this changed over time? To be clear, not all of the data to answer such questions is publicly available, however through the process of extrapolation we can develop charts and statistics that are directionally correct. This process is described below for those that may be interested. Walmart and Sam’s Club retail square footage is information that is readily available thus we can chart this information against distribution square footage for the U.S. market. Walmart and Sam’s Club net Sales information is readily available thus we can chart this information against distribution square footage for the U.S. market. Information on the % of net sales sold through the distribution network is also available for both Walmart and Sam;’s Club hence we can identify the net sales through the DC network as a more meaningful ratio because it excludes DSD sales (i.e. sales through the direct store delivery channel). Information on the cost of sales (cost of goods sold) is more challenging because this number is a consolidated figure for all business divisions including international. Thus the International cost of goods needs to be removed to derive the cost of goods sold through the U.S. so we used the International sales revenue as a % to total sales to pull out cost of goods associated with international markets. We then determined the U.S. cost of goods sold for Walmart and for Sam’s Club by again using net sales as a percent to total sales for each division. We then applied the % of goods sold through the distribution network to the cost of sales figures separately for Walmart and for Sam’s Club because the business models are very different. Walmart tends to ship 80-85% of its cost of goods through its distribution network whereas Sam’s Club tends to ship between 60-65% through its network. Using this extrapolation technique, we came up with an estimated total cost of goods sold through the company’s U.S. distribution network. It is definitely not perfect information but the charts should be directionally correct. Keep in mind that Walmart self-distributes partial-line pharmaceuticals products and the dollar value of pharmaceuticals is extremely high relative to the square footage of distribution space needed to support this business. For this reason, Walmart’s cost of goods sold per square footage of distribution center space will likely be much higher as compared to similar retailers that do not self-distribute pharmaceuticals. Also keep in mind that Sam’s Club sales revenue relative to distribution center square feet is much higher than most retailers because most of the non-DSD merchandise passes through smaller crossdock facilities in pallet quantities. It is not possible to break out the Sam’s Club DC network from the Walmart DC network because these networks are converged meaning that many of Walmart’s facilities also serve Sam’s Club stores, particularly on the food side of the business. This distortion causes a higher sales figure per square footage of distribution center space as compared to a retailer that does not operate with a club store concept! Lastly, it is important to keep in mind that all of the warehouse space that a company requires can never be captured throughout its history for things like 3rd party facilities that come and go, the use of outside storage warehouses or trailers to hold excess inventory, etc. Suffice to say that recording the history of any company’s distribution center space is not a perfect science . Hopefully these issues do not change the results derived below. Having said the above qualifying statements, below are several charts of key ratios that hopefully help to make sense of how Walmart has become more efficient over the years from a supply chain perspective. What do the charts above tell us? As we mentioned in the qualifying statements, these results are not necessarily useful to benchmark against other retailers because they are highly dependent on the product lines being distributed and the retail store format being serviced. Sales of pharmaceuticals create extremely high revenues and require a small distribution footprint. Sales through the warehouse club format are high relative to the distribution center footprint because the goods are primarily cross-docked in pallet loads and there is a low labor/space requirement to move goods to market. What we can use the above charts for is to benchmark Walmart against itself over time. We have always advocated that most industry-wide benchmarking efforts provide meaningless results. The only benchmarking that matters is to measure one’s own performance against oneself over time. The first chart depicts the number of retail square feet supported by distribution center square feet over time. We can see that this ratio has leveled out to about 6.2 over time. Now one may look at this curve and suppose that Walmart has actually become more inefficient because this ratio has declined over the years. It would be a grave mistake to draw this conclusion. Walmart is an industry leader at cutting costs - we all know this. What this chart helps to prove is that Walmart reduces the net landed cost of the product to the retail shelf by increasing the amount of control that the company has over distribution. Distribution centers are not evil cost centers that must be beaten into the ground to drive costs out. Distribution centers are absolutely critical to the success of the business and its ability to be price competitive. “Distribution and transportation have been so successful at Walmart because senior management views this part of the company as a competitive advantage, not as some afterthought or necessary evil. And they support it with capital investment. A lot of companies don’t want to spend the money on distribution unless they have to. Ours spends because we continually demonstrate that it lowers our costs. This is a very important strategic point in understanding Walmart.” - Mr. Joe Hardin, executive vice president, logistics personnel (1986 - 1997). The second chart depicts Walmart’s net sales revenue to the U.S. market as a ratio to square footage of distribution center space within the U.S. From this chart we can see that this ratio has steadily increased over time which may in part be caused by inflation. The data suggests that this figure is currently running just below $2200 of Non-DSD net sales revenue per square foot of distribution space. The important thing is that this value has increased over time which means that more volume and/or higher dollar value merchandise is being moved through the DC network. This implies better margins and better leverage from existing assets - in other words better return on assets over time as far as distribution assets are concerned. The third chart depicts Walmart’s non-DSD cost of goods sold to the U.S. market relative to square footage of distribution center space within the U.S. From this chart we again see a steady increase over time, in part due to inflation, but mostly due to increased volume and higher value merchandise being distributed through the company’s network. The data suggests that this figure is currently running at around $1600 of non-DSD cost of goods sold per square foot of distribution space. As per the qualifying statements, this graph is generated through data extrapolation methods because cost of goods sold for non-DSD merchandise is not publicly reported therefore it may be subject to error. MWPVL International Inc. does not represent Walmart nor do we have a business relationship with Walmart. This is a research paper for educational purposes only. The information assembled in this research paper is intended to provide the audience with intelligence on the subject of world class strategies for distribution networks. In preparing this material, MWPVL International Inc. has not disclosed any private or confidential company information. MWPVL International Inc. has made every effort to ensure that the information contained within this white paper is as accurate and as up to date as possible. However, it is important to note that distribution networks change over time and for this reason there is a possibility that information contained within this paper may be out of date or inaccurate. If you wish to submit any information to improve the quality of this white paper, please be sure to send us some feedback.